H-1B extensions of stay under AC21. The final rule addresses the ability of H-1B nonimmigrant workers who are being sponsored for LPR status (and their dependents in H-4 nonimmigrant status) to extend their nonimmigrant stay beyond the otherwise applicable 6-year limit pursuant to AC21. INA 204(j) portability. The final rule addresses the ability of certain workers who have pending applications for adjustment of status to change employers or jobs without endangering the approved Form I-140 petitions filed on their behalf. H-1B portability. The final rule addresses the ability of H-1B nonimmigrant workers to change jobs or employers, including: (1) beginning employment with new H-1B employers upon the filing of non-frivolous petitions for new H-1B employment (“H-1B portability petition”); and (2) allowing H-1B employers to file successive H-1B portability petitions (often referred to as “bridge petitions”) and clarifying how these petitions affect lawful status and work authorization. Counting against the H-1B annual cap. The final rule clarifies the way in which H-1B nonimmigrant workers are counted against the annual H-1B numerical cap, including: (1) the method for calculating when these workers may access socalled remainder time (i.e., time when they were physically outside the United States), thus allowing them to use their full period of H-1B admission; and (2) the method for determining which H-1B nonimmigrant workers are “cap-exempt” as a result of previously being counted against the cap. Form I-140 petition validity. The final rule clarifies the circumstances under which an approved Immigrant Petition for Alien Worker (Form I-140 petition) remains valid, even after the petitioner withdraws the petition or the petitioner’s business terminates, including for purposes of status extension applications filed on behalf of the beneficiary, job portability of H-1B nonimmigrants, and job portability under section 204(j) of the Immigration and Nationality Act (INA), 8 U.S.C. 1154(j). Retention of priority dates. To enhance job portability for workers with approved Form I-140 petitions, the final rule explains the circumstances under which workers may retain priority dates and effectively transfer those dates to new and subsequently approved Form I-140 petitions. Priority date retention will generally be available as long as the approval of the initial Form I-140 petition was not revoked for fraud, willful misrepresentation of a material fact, the invalidation or revocation of a labor certification, or material error. This provision improves the ability of certain workers to accept promotions, change employers, or pursue other employment opportunities without fear of losing their place in line for immigrant visas. See final 8 CFR 204.5(e). Retention of employment-based immigrant visa petitions. To enhance job portability for certain workers with approved Form I-140 petitions in the EB-1, second preference (EB-2), and third preference (EB-3) categories, but who are unable to obtain LPR status due to immigrant visa backlogs, the final rule provides that Form I-140 petitions that have been approved for 180 days or more would no longer be subject to automatic revocation based solely on withdrawal by the petitioner or the termination of the petitioner’s business. See final 8 CFR 205.1(a)(3)(iii)(C) and (D). Eligibility for employment authorization in compelling circumstances. To enhance stability and job flexibility for certain high-skilled nonimmigrant workers in the United States with approved Form I-140 petitions who cannot obtain an immigrant visa due to statutory limits on the number of immigrant visas that may be issued, the final rule allows certain beneficiaries in the United States in E-3, H- 1B, H-1B1, L-1, or O-1 nonimmigrant status to apply for separate employment authorization for a limited period if there are compelling circumstances that, in the discretion of DHS, justify the issuance of employment authorization. See final 8 CFR 204.5(p). 10-day nonimmigrant grace periods. To promote stability and flexibility for certain high-skilled nonimmigrant workers, the final rule provides two grace periods of up to 10 days, consistent with those already available to individuals in some nonimmigrant classifications, to individuals in the E-1, E-2, E-3, L-1, and TN classifications. The rule allows an initial grace period of up to 10 days prior to the start of an authorized validity period, which provides nonimmigrants in the above classifications a reasonable amount of time to enter the United States and prepare to begin employment in the country. The rule also allows a second grace period of up to 10 days after the end of an authorized validity period, which provides a reasonable amount of time for such nonimmigrants to depart the United States or take other actions to extend, change, or otherwise maintain lawful status. See final 8 CFR 214.1(l)(1). 60-day nonimmigrant grace periods. To further enhance job portability, the final rule establishes a grace period of up to 60 consecutive days during each authorized validity period for individuals in the E-1, E-2, E-3, H-1B, H-1B1, L-1, O-1 or TN classifications. This grace period allows high-skilled workers in these classifications, including those whose employment ceases prior to the end of the petition validity period, to more readily pursue new employment should they be eligible for other employer-sponsored nonimmigrant classifications or employment in the same classification with a new employer. The grace period also allows U.S. employers to more easily facilitate changes in employment for existing or newly recruited nonimmigrant workers. See final 8 CFR 214.1(l)(2). H-1B licensing. To provide clarity and certainty to the regulated community, the final regulations codify current DHS policy regarding exceptions to the requirement that makes the approval of an H-1B petition contingent upon the beneficiary’s licensure where licensure is required to fully perform the duties of the relevant specialty occupation. The final rule generally allows for the temporary approval of an H-1B petition for an otherwise eligible unlicensed worker, if the petitioner can demonstrate that the worker is unable for certain technical reasons to obtain the required license before obtaining H-1B status. 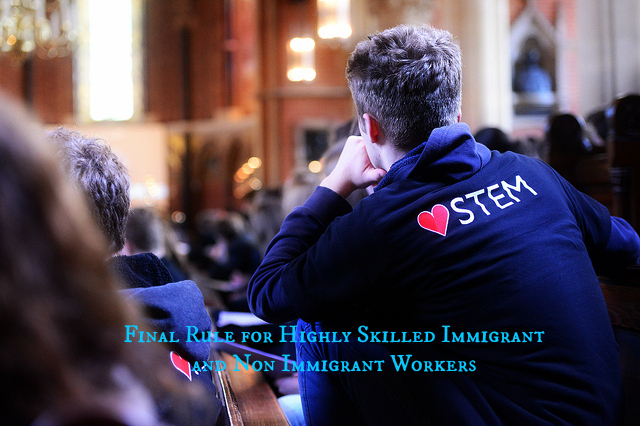 The final rule also clarifies the types of evidence that would need to be submitted to support approval of an H-1B petition on behalf of an unlicensed worker who will work in a state that allows the individual to be employed in the relevant occupation under the supervision of licensed senior or supervisory personnel. See final 8 CFR 214.2(h)(4)(v)(C). Adjudication of EADs: The final rule clarifies that USCIS will no longer be constrained to the 90-day processing time for the adjudication of Employment Authorization Cards. EAD renewals will now be able to be filed 180 days before the expiration of the EAD card to prevent employment gaps. USCIS will grant an automatic EAD extension of up to 180 days based on a pending EAD renewal, however this will not apply to H-4 or L-2 based EADs. Form I-485 Supplement J: In order to continue receiving eligibility for adjustment of status based on an existing or new job offer under INA 204(j) the worker will be required to file a Form I-485 Supplement J and submit evidence regarding the new job offer for continued AOS eligibility.